The Right Honorable Justin Trudeau’s Liberal Government is changing the name of Foreign Affairs, Trade and Development Canada to the simpler Global Affairs Canada. The department had seen its name changed before on June 26, 2013, when the Department of Foreign Affairs and International Trade merged with the Canadian International Development Agency to become the Department of Foreign Affairs, Trade and Development (DFATD). Who is Global Affairs Canada Authentication Services Section? Global Affairs Canada Authentication Services Section is located in Ottawa close to our office and takes care of the first step of the authentication and legalization process. The name change of the department does not affect our authentication service. We will provide the same quality service that you are used to. What does change is what the authentication stamp and seal will look like. However, this does not make any authenticated documents with the previously used stamp invalid. For Global Affairs Canada to be able to authenticate a document it needs to be signed by an approved official of whom they have the signature on file. Once the signature is verified as being valid, they will stamp, seal and sign the document. There are some additional requirements needed for certain documents before Global Affairs Canada can authenticate them. Our experienced agents and consultation with you will guarantee that your document meets all the necessary requirements. To verify whether your document is ready to be authenticated you can use our Quick & Easy Verification. What happens after Global Affairs Canada Authentication Services Section? For a Canadian document to be seen as valid in another country, after the authentication of the document it needs to be attested by the Embassy, Consulate or High Commission of the country that the document will be used in. This step is also referred to as legalization. Each country has its own requirements and fees for the legalization of a document and these requirements and fees often change. Our experts can assist you in getting all the requirements in order to avoid delays later in the process. For more information on legalization of documents you can visit our Legalization Service page. 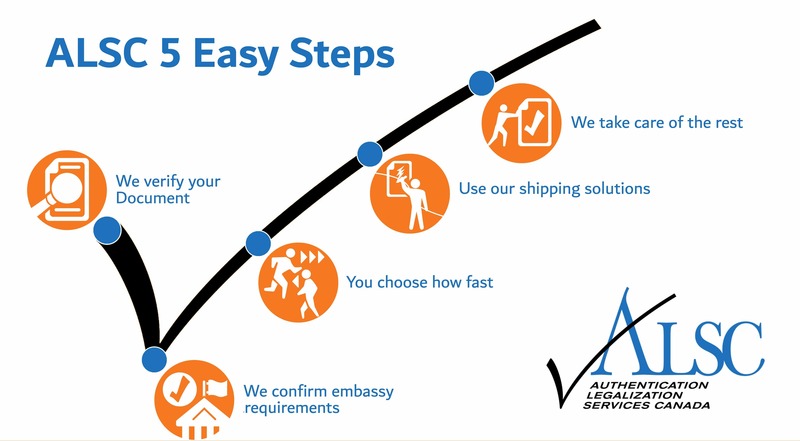 Once the process of authentication and legalization is complete, your document will be accepted in country. These two steps combined are also recognized as the equivalent of an Apostille.